Well, after their stomping on Tuesday night, the Wild have decided to get it together. Two more wins under their belt, and the kids are starting to get sent down. Much as I like getting to see them play, to me seeing the regulars in the lineup makes me think the season is really getting here. 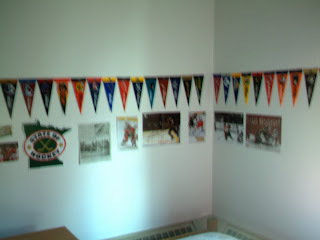 To celebrate that fact, I made a hockey corner in my room using the pennents for all the NHL teams, and also some posters, pictures, and newspaper clippings. I'll decorate more later, but it's early in the school year and I'm already getting dumped on. It's not much, and my camera is kind of fuzzy (or maybe I'm the fuzzy one), but it makes me smile. The picture in the far left corner is of Boogaard looming over Chelios. That is definitely my favorite part of the wall. Also, I'd like to send a big thank you out to Teebz for sending me a beautiful copy of the Heritage Classic game. I finally got a chance to watch it last night, and it's awesome! Thank you so much, Teebz!